Details. All those little touches that add up to the look of your wedding day. All of your chosen jewelry, including your wedding rings, earrings, necklace, and bracelets are carefully chosen to compliment and accent your chosen wedding gown. Your shoes are an important wardrobe detail and no bride goes without putting a picture of them in her finished wedding album.The flowers you choose for your ceremony and reception, as well as those chosen for your bouquet, your bridesmaid’s flowers and those that will be worn by the groom and his groomsmen and ushers, are all carefully chosen to set the mood of your event.Your wedding invitation, dinner menus, ceremony programs and other printed materials say a lot about you. You will choose them carefully and I will document them artfully. The overall look of your ballroom, elegantly prepared for you and your guests will be photographed for you to remember forever. Your wedding cake, the cake topper, your champagne glasses...everything...will be captured for a lifetime of memories.The simple ring shot you see here is one of my favorites and has become a favorite of many of my clients. The bride and groom are both accomplished musicians and wanted me to create something special using the sheet music for one of their favorite songs. They had a wonderful wedding reception at Oheka Castle in Huntington, NY and gave great consideration to the orchestra that provided the entertainment for their event. 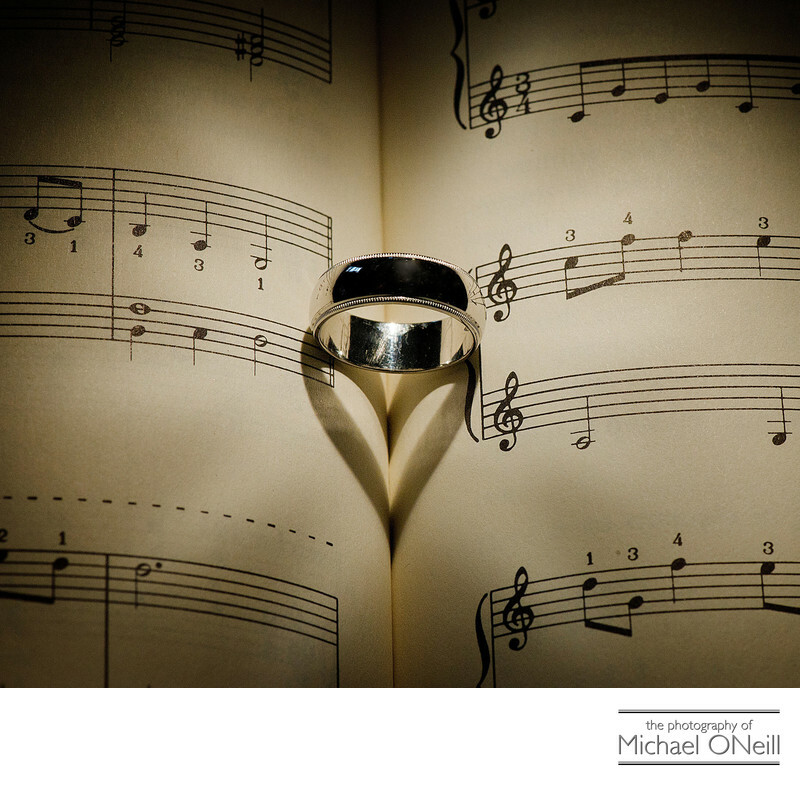 I set the groom’s ring carefully in the gutter of the music book and directed my assistant hold a small tungsten light source in such a way as to cast a heart shaped shadow onto the book. The bride and groom absolutely adored this photograph; a small detail from their wedding day which says so much about them personally.